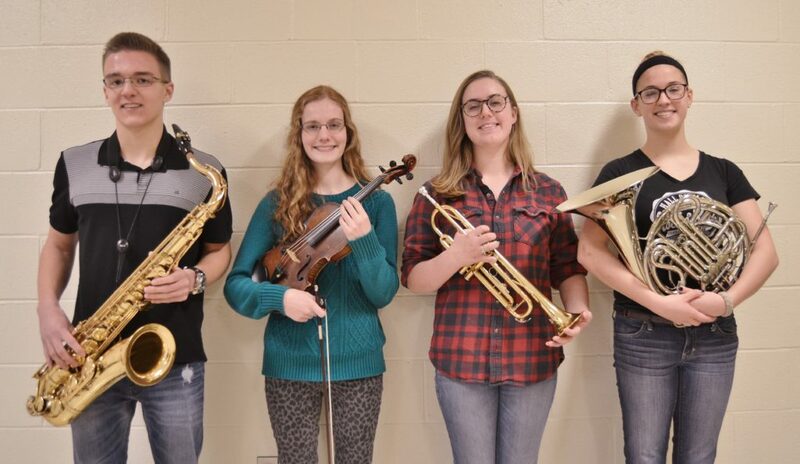 Four talented Penn Manor High School students – Madeline Claus, Kenny Lashley, Emma Young and Julia Young – have been selected to perform in the District 7 Orchestra and Lower Band Festivals in the coming months. Madeline (violin) was selected for orchestra, and Kenny (tenor saxophone), Emma (horn) and Julia (trumpet) were selected for band following a day of auditions for students from Lancaster, Lebanon, Adams, Cumberland, Dauphin, Franklin, Perry and York counties. The student musicians were asked to prepare all of their major scales (memorized), along with a piece of solo repertoire for their respective instruments. For strings, there also was a sight-reading audition. The top finishers were invited to perform with their peers from across the region at the Pennsylvania Music Educators Association District 7 Orchestra Festival Jan. 27 and 28 and the Lower Band Festival Feb. 10 and 11, both in York. A public concert for orchestra will be presented at 7 p.m. Jan. 28 in the Central York High School auditorium, 601 Mundis Mill Road. A public concert for band will be presented at 7:30 p.m. Feb. 11 in the Eastern York High School Performing Arts Center, 720 Cool Creek Road. Congratulations, students, on your well-deserved honors! Penn Manor students selected to District Orchestra and Band are, from left, Kenny Lashley, Madeline Claus, Julia Young and Emma Young.